I grew up in Southern Ontario and although we took several family road trips to the U.S.A. during my childhood, it wasn't until recently that I ventured outside of Ontario within my own Country. My curiosity about the other provinces was first peaked as a child, when I read Anne of Green Gables and read L.M. Montgomery's romantic descriptions of the beauty of Prince Edward Island. When I learned more about the geography of our whole country, I found myself with an unspoken bucket list item, to visit the coasts of Canada someday. 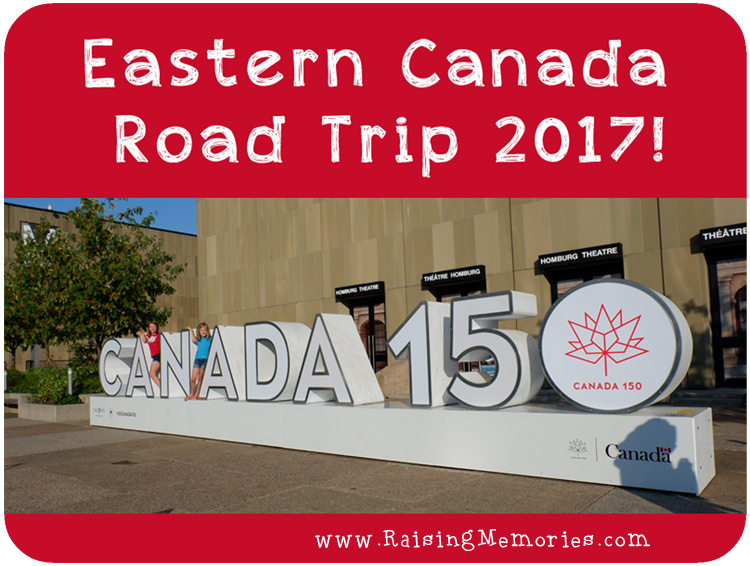 This year is Canada's 150th and it seemed like an appropriate time to take that leap (or drive, in this case) and visit Eastern Canada with my family! If you're following me on Instagram, you already know that we began our journey on the first of this month. 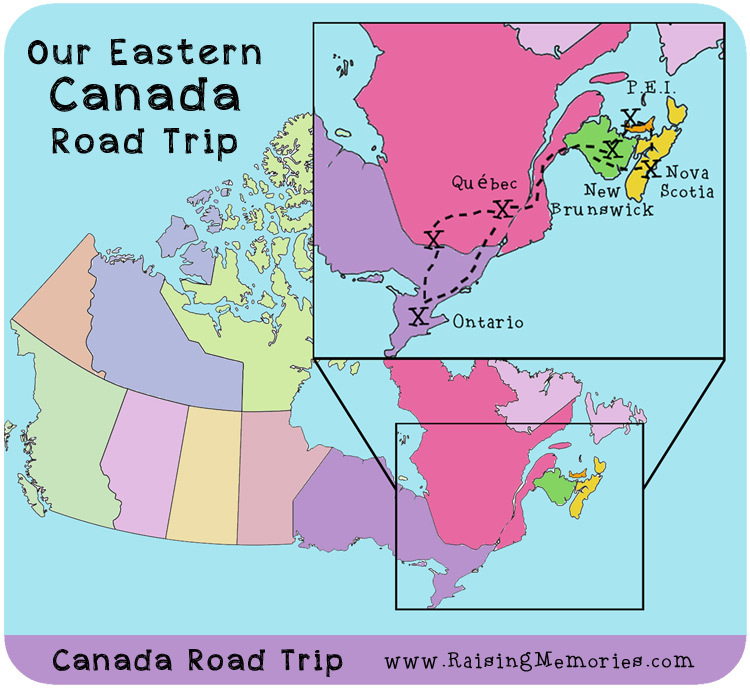 Now that we have returned home, I have so much that I want to share with you about our experiences and what we learned about road-tripping across Canada with kids! The photo below was taken on Prince Edward Island- I finally set foot on that red soil! Someday I hope to set foot in British Columbia too, but for now I am thrilled to share our experiences from this road trip from Ontario, through Quebec, New Brunswick, Nova Scotia, and Prince Edward Island. I'll be posting about the trip in parts, throughout the rest of this month. I hope you'll enjoy hearing about the things we did (and perhaps get some ideas for your own future visits to these provinces). Love Eastern Canada! We went to PEI last summer and Halifax this summer. Loved every moment! It's so cool to get out there! You'll have to get into New Brunswick someday, to see Hopewell Rocks- it's really amazing to see in person! L.M. Montgomery's books captured my childhood imagination as well. A visit to PEI would be amazing. So excited to follow along on your trip. Thanks Deanna! I'm always a little surprised when I hear someone hasn't read Anne of Green Gables ;) I loved it so much! I can't wait to read more. This is a trip we have yet to make together as a family. It is one I will pitch soon as a big family travel adventure for the blog and for my readers to follow too. Thank you :) You will love it when you do it someday! Being from Alberta I've been to B.C. many times but have never been east, I want to go to the eastern provinces soon though. The furthest East that I've been is New Brunswick (road trip from MB). I'd love to visit PEI and Nova Scotia too. I really want to make it out East, it's on my list. What an incredible trip! Travelling is great, I've traveled many parts of western Canada but not eastern yet. This would be such an adventure and I bet the everyone was so excited. I would have loved an adventure like this when I was a kid. What a great way to celebrate Canada's 150th birthday! I've been to all the provinces, but none of the territories (yet). I've loved reading all your posts about this trip. Road trips are my favortie vacation because you get to experience so much and really see the landscapes. Thank you! :) Yes, it was very cool to see the different scenery! I wish that I could do something like that but unfortunately not in my budget! I am the same ! I haven't been outside of Ontario , I really want to see more of it ! I'd love to see every province ! I need to get going ! Id love to see BC and Church Hill Manitoba is on my bucket list ! I remember one trip east from MB to Ontario which was terrifying! I'm deadly serious, you see along the way we were stopped by the police (as was everyone else) and told that a part of Hwy #2 along the north of Lake Ontario had fallen into the lake! The only other route was via a logger's road. It was a 450 km detour and of course night fell too. I closed my eyes half the time, I really was petrified and I lost count of the moose we encountered whilst it was light. Oh my goodness, that's SO Crazy!! !